From a thread of wool to the box – all steps in the production process are Made in France. Every piece of our collection is the the perfect mixture of knowledge and tradition of the best local workshops within the hexagon. Born of a thousand desires, idealist and enthusiastic, Le Slip Français is a big and optimistic French adventure. A modern enterprise which, with sincerity and happiness, shares its creations and precious moments. In 2013 we came across the company Lemahieu, which is situated just next to Lille in the North of France. 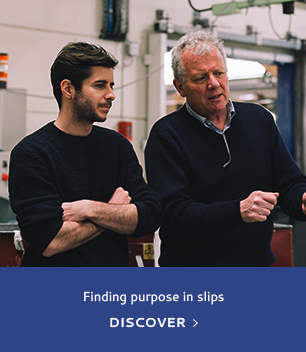 Founded 60 years ago, the family company is nowadays lead by Edith and Oliver and employs 110 people. It’s exactly in this place where we produce our Le Slip Français underwear. All steps of the process happen in the company: knitting, cutting, assembling, quality control and packaging. Lemahieu is one of the cornerstones of our craftmanship and accompanies us on our adventure since 4 years and we are looking forward to grow together in the future. A few kilometers away from Nîmes, with 70 years of experience, our atelier in Aimargues is a textile specialist and also, the inventor of the famous kangaroo brief. This convinced us to produce our Slips français here! At Le Slip Français, we don’t joke about craftsmanship. Our manufacturer in Les Cars, close to Limoges, is a real specialist of socks. It has received the label recognising its cultural heritage, today combining its traditional know-how with technological innovation. For the (big) pleasure of our feet! The briefs from Le Slip Francais are made out of cotton – and as you probably know, there are no cotton fields in France. The cotton thread of which our products are made out of then, arrives in our workshops in big reels. 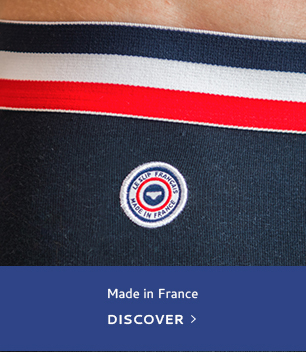 From that point on, all steps of the production, from the knitting until the packaging is made in France. The most part of the cotton we are using is coming from India, Egypt and the United-States. They are OEKO-TEX® certified, which means that they were running through several tests in order to match the standard 100 of OEKO-TEX®. This guarantees that our cotton is free from products that are toxic for the body and the environment. Today, in order to continue to change the world a bit more everyday, we are searching ways to innovate the textile production, mainly by finding fabric that maybe one day will replace cotton. We are already now trying out different methods, for example using more linen – where France is the major producer and where the production needs way less water. We consider as well nettles. To our own surprise,it is really possible to produce briefs that are mainly made out of nettles. And we promise – they don’t hurt !